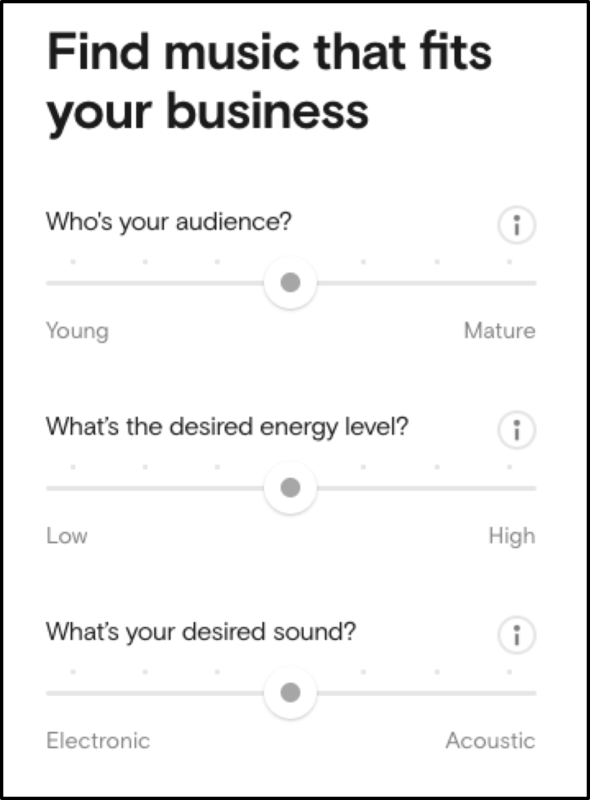 Spotify has created a way to use its background music on your business, is called Soundtrack Your Brand. Why use this service in my business? As you know, one of the newest ways to differentiate your business from the competition is the so-called sensory marketing. This popular concept in the world of marketing basically involves attracting and engaging customers through the use of sensory stimuli. A clear example of how sensory marketing can become a key aspect of the success of a business is the famous Starbucks chain. One of the fundamental elements of the success of this chain is found above all in the smell of its establishments – the smell of coffee-, which is able to fill a good part of its points of sale to the point of greatly affecting the positioning of its brand. However, the smell is not the only sensory stimulus capable of making us reach the top of our business market. Music is also capable of generating an infinite amount of emotions in customers, such as the feeling of relaxation, which can help improve the shopping experience in stores, thus achieving more sales chances. However, obtaining music for commercial use is not as simple as it seems, since the vast majority of songs on the current music scene are protected by the so-called copyrights. Luckily for you, the largest music streaming company, Spotify, has a service called Soundtrack Your Brand capable of converting something as complicated as the use of music for business in an extremely easy task. Soundtrack Your Brand is a Swedish startup dedicated to providing its clients with all kinds of legal background music in exchange for a monthly payment. This online platform was founded in 2013 by Ola Sars and Andreas Liffgarden, former employees of Spotify. The use of CDs when playing background music in many bars, restaurants and coffee shops was becoming very outdated. The businesses had access through the Internet to a great number of options to obtain free music and later they were facing legal problems because of that. In order to offer a totally legal musical tool for restaurants, fashion stores, hotels and all kinds of physical businesses, Sars and Liffgarden left their works and founded Soundtrack Your Brand. Not only did they take several Spotify workers with the aim of growing this new company in the same way, but they have a signed agreement with the company so that a significant part of the funding comes from them. In fact, Soundtrack Your Brand is also known by the name of Spotify for Business, although legally and officially it can only work under that name within Scandinavian territory. In these few years both the legal music selling market and this company in particular, have grown enormously. Soundtrack Your Brand already has numerous well-known brands as customers, such as IKEA, TAG Heuer, McDonald’s among many others and is used by small and large businesses all over the world. Easiness when creating and using an account (we’ll see it below). A large number of songs available (around 30 million songs). Help and support to choose the right type of song for each business and for each business objective. Your company has the key to its success not only in its products or services but in the experience it offers its consumers. As you may have noticed personally, music plays a subtle but very important role in offering that superior experience to any client, anywhere. And the simplest and most economical way today to put background music in your gym, restaurant, bar, cafeteria, hotel or store without having to pay large amounts to the PRO’s like BMI, ASCAP or SESAC in the USA or musical society of your country is to use Soundtrack Your service Brand. An incredible amount and variety of songs. To be able to play your own Spotify playlists. Automatic music update to avoid saturation of customers and employees. No need to have an Internet connection to play the music. To be able to program the songs at certain times. Manage several locations from the same device. Unlike other platforms that offer different prices depending on the type of business or square meters of the local, Soundtrack Your Brand has a fixed price: $26.99 per month. In addition, this online service is currently offering a completely free trial period of one month so you can verify without any compromise all the good things offered by its platform. Next, I will show you step by step how to create a new account. The first thing you will do is enter their webpage. Once there, we will click on the “Sign Up” button. We will be asked to fill in a form with basic information about our company: name of the company, type of business, name of the contact person, email and password of the new account. Once we have finished filling in the data, we click on “Sign up” again. Next, the platform will ask us for a final process in which we will have to provide some more specific data about our company. To do this we must click on the blue “Start here” button. When we do that, another form will appear. In this case, it will ask us for information about the location of our company: address, postal code, country, city and VAT number (company identification number in European territory). Ask the Tax Agency of your country, which will accept or not your request depending on their own conditions. Select the VAT exemption option (easier). 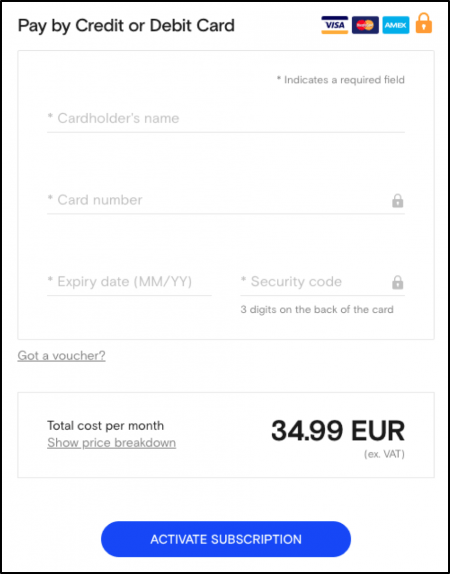 With the second option, we can continue with the activation of the subscription without needing to obtain the number. However, what we will be asked for in return is more information about our company: name of this, type of company (AB, SL, Ltd …), description of the activity of the company, main address, postal code, country, name of the contact person, email and mobile phone. At the end of filling in the form, we must click on “Continue“. And to end the activation, you just need to match the account with the device you want to use to handle Soundtrack Your Brand: your mobile phone / tablet, computer or hardware. We have our account ready to be used! Remember that now you can try it for free during the first month and that you should start paying from the second month at a price of $26.99 in case you want to continue with the service. Otherwise, you can simply cancel your account at any time and no charge will be made. How to put background music? One of the fundamental characteristics that explain the success of this service is the simplicity of its use. Still, so that there is no doubt, we’re going to explain step by step how to make the platform work. 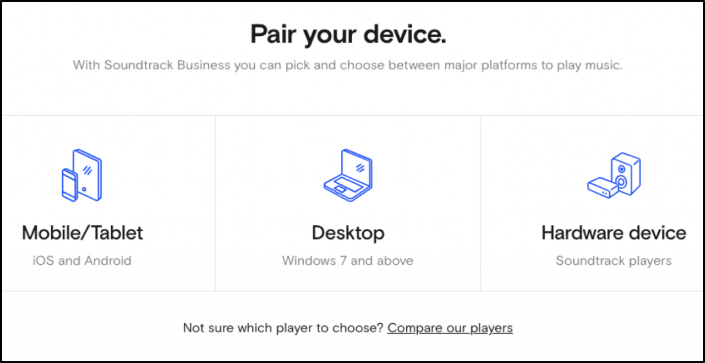 As we can see, the first thing that the platform will allow us when looking for the best background music for our business is choosing between songs (‘soundtracks’) or lists (‘playlists’). We will choose one or another option depending on what we’re looking for. However, through this option, we will have to go song by song. To make the process faster and more efficient, it is best to search for entire playlists. If instead of looking for songs we choose the option to search for playlists, we will see specific music lists according to several factors: type of business, musical genre, decade, type of sound, popularity, transmitted emotion, etc. In addition, as we had anticipated, the platform also gives us the ability to import our own Spotify lists. 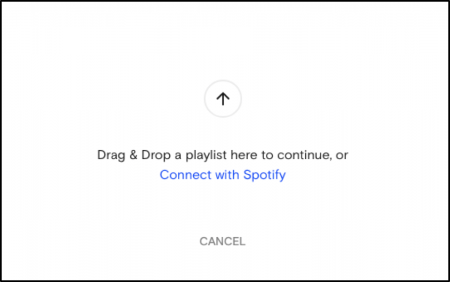 As we can see, in case we have our Spotify account open, the platform will give us the option to drag and drop the lists directly, although, otherwise, we must select “Connect with Spotify” to log in and import them from there. In case we do not have a Spotify account, Soundtrack Your Brand also offers us directly a list of the most popular songs in our country that we can use without the need to create any other account and without the need to import any list. If we want to get a list of popular Spotify songs from another country, we can easily change the region with the “Change region” option. How to program the music? This option called “Schedule” is what allows us to program the songs and playlists during the different days of the week at the specific time we need. In it, we must write the name we want to give to that programming and click again on “Create“. We will then see a calendar in which we can add songs and playlists on the day and at the time we think appropriate. To do it simply drag and drop the themes or playlists that we want to incorporate. Remember that in programming you have to take into account very important aspects such as the day you probably have more customers, the peak hours, the mood that your workers and customers may have at certain times, etc. It is best to perform several tests throughout the first week and then find the best pace. Background music, along with other elements such as the predominant colors of establishments and their smells, is gaining increasing importance when it comes to making a physical company succeed. However, the copyrights of most songs make us go with great caution when obtaining this type of music. Soundtrack Your Brand is probably the best option in the market to put background streaming music in your business, either for its affordable price, its direct connection with Spotify or the wide variety of themes and connection and playback facilities it offers.